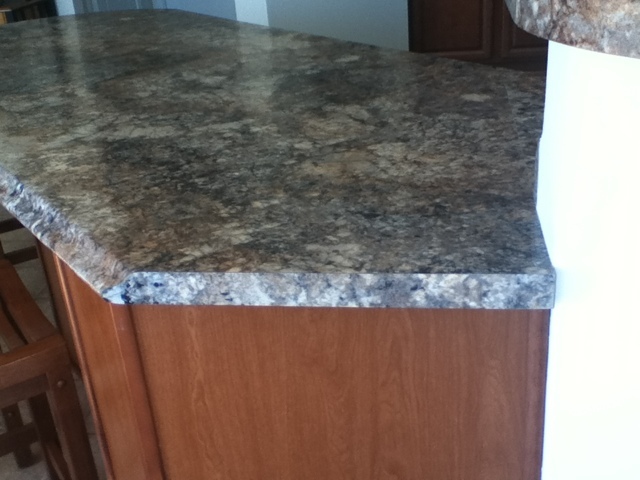 Here are some shots of the ogee edge on our Formica 180FX Antique Mascarello. I am stuck using Blogger from my iPod since DH is using the laptop for watching his beloved Bills, so I can't do much formatting. The pictures are of the breakfast bar , peninsula and an end where there would typically be a side splash and our PM was able to do without them as I did not care for the look of them. Your cabinets look awesome, Rachel! Did you have to pay an upgrade or it was a standard in your area? 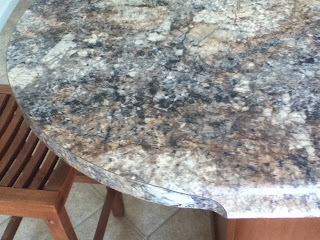 Our SR told me they will not put any designer edges on the formica at ALL!! This is where a non standard request must be submitted. Thanks, Nadase. We love our cabinets, too. They are the Scottsdale Maple Cognac. In our community, oak cabinets are standard. Ours were an upgrade but well worth it to us. The counters are the upgraded Formica which automatically got us the ogee edge. If we were only getting the square edge, I think I would have really pushed for granite. Oops! 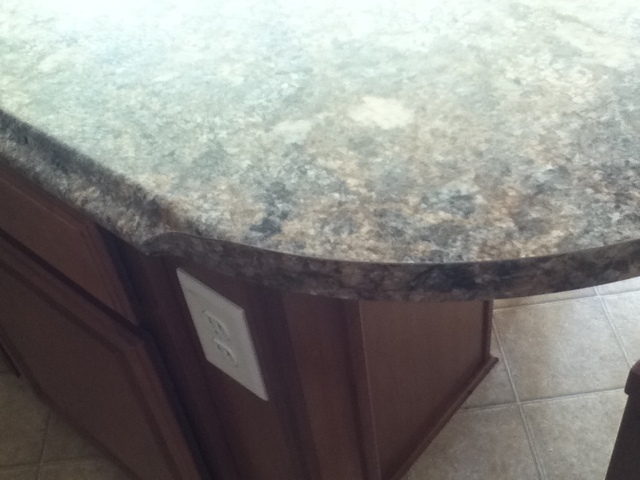 I just realized from your comment that I wrote your cabinets look awesome which they do; however, I meant to type your countertops look awesome with the ogee edges. Our SR said they do not put the designer edges on the formica which meant putting in a special request in our community to get them. I was going to get the formica on the Wet Bar until she said, they won't do it. 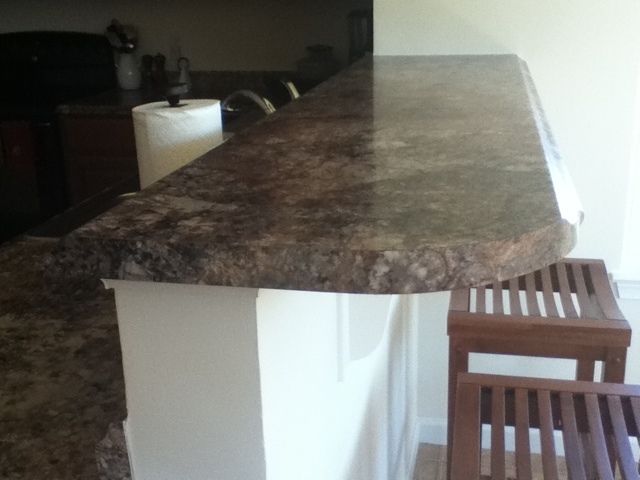 I did not push for the edges and just took hit and got the granite on the Wet Bar which is what I wanted from the beginning. Those edges look great! I didn't even think to ask about edges during the building process. 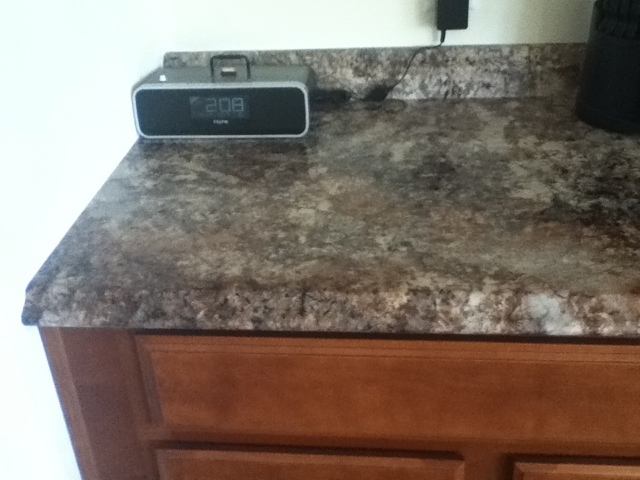 I am glad the faux granite (what I like to call it) looks as good as it does. I was a little nervous about it but it really looks nice. The original plan I had was to rip the faux granite out and get quartz but I think I'll keep these around for awhile. There is so much going on in other rooms in the house and outside that needs to be tackled first. Good luck Amanda! I like the seats you got for the breakfast bar. How tall are they? Sheldon, the stools are Parker stools from Hayneedle.com. 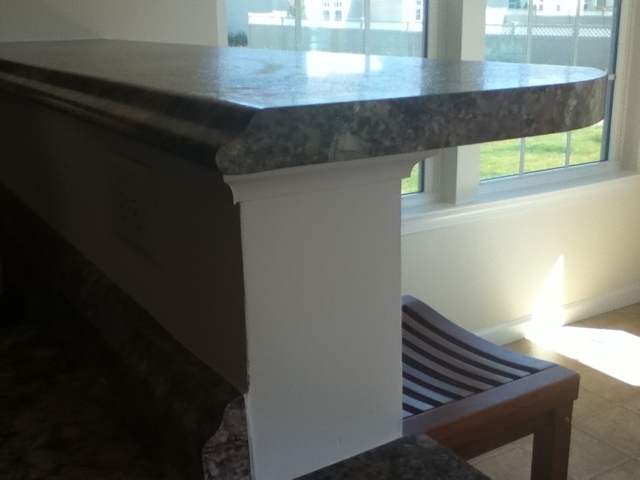 We have the 24" stools for the peninsula and 29" stools for the breakfast bar. Stuart, from "That's Right, It's Another Verona," also has these stools. Here's the link: http://www.hayneedle.com/sale/parkercounterstool.cfm.